A few weeks before McCrae Williams ’21 died, he traveled to Fiji with his family to dive the Great White Wall, a swaying, 600-foot hedge of soft coral and frilly sea fans. Beneath the water, the coral appears shadowy gray. But when the moon is full and tide just right, the wall blooms a brilliant white, transforming hilly reefs into what look like snow-capped peaks. “We were at 105 feet when we saw it happen,” says McCrae’s father, Chris Williams. McCrae, who died Sept. 12 from a head injury sustained during a fall in his dorm room, was a certified scuba diver with a passion for travel instilled from when his family lived in London for a few years. Having a mother who works as a safari planner also abetted his wanderlust. 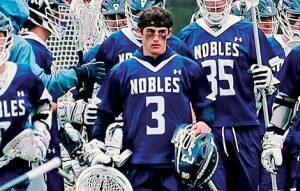 McCrae Williams ’21 was captain and goalie of his high school lacrosse team at Noble & Greenough School in Dedham, Mass. A goalie for the Lafayette lacrosse team with aspirations of becoming either an orthopedic surgeon or finance manager, McCrae also had a love for the arts. Over the summer, he parlayed his talent for photography and video editing into a job by shooting drone videos for real estate agencies, developers, and billboard companies. Nancy Waters, associate professor of biology, who served as McCrae’s first-year adviser, discovered that when she asked him to answer a series of questions before their first meeting. Prompted to list the four things he most wanted to accomplish at Lafayette, McCrae replied: Succeed academically and athletically, make everlasting friendships, build on social skills, and graduate with a major and minor. McCrae liked to think of himself as his team’s “last line of defense,” says his father, Chris. “Having the team’s back was really important to him. Math Professor Rob Root, who had McCrae in his First-Year Seminar, says he didn’t know McCrae well, but glimpsed an expression of “intellectual grit” in the young man after Root commented that his writing log needed improvement. That describes McCrae, says Chris, noting that his son was incredibly mission oriented. He also was known by his coaches as a fierce competitor, “filled with courage, consumed with perseverance, and a true leader who lifted his teammates’ love of the game to the next level,” adds his mother, Dianne. Deciding to donate McCrae’s organs was an easy call because he would have wanted to save someone else’s life if he could, says Dianne. “They’re all doing great,” she says of the five recipients. After McCrae died, the family came together, and using words that started with each letter of his first name—mission, courage, character, respect, academics and empathy—tried to define a young man they all dearly loved.